Wrath, the sixth of the seven deadly sins, seems to have taken hold of humanity. On Sunday, two Coptic Christian churches in Egypt were bombed, killing at least 44 people and prompting the country to declare a state of emergency for three months. Forty-eight hours before that, a man mowed down pedestrians with a truck in Sweden, killing at least four people. That recalled other such attacks on London's Westminster Bridge on March 22, Berlin's packed Christmas market on Dec 19 last year and Nice in France on July 14 last year. At least 101 people were killed in the last three attacks. Here, a video recording last Tuesday of a woman gone berserk at Tiong Bahru Plaza, pummelling two shopgirls with her fists, went viral. The source of such fury, argues Pankaj Mishra in this new book, is the progress unleashed by two revolutions: of the monarchy-toppling French from 1789 to 1799 and of the factory-founding industrial one, driven by the British from 1760. Mishra, who turns 48 this year, is an India-born and educated author and essayist who has, in the past 10 years, become especially noted for his non-fiction. 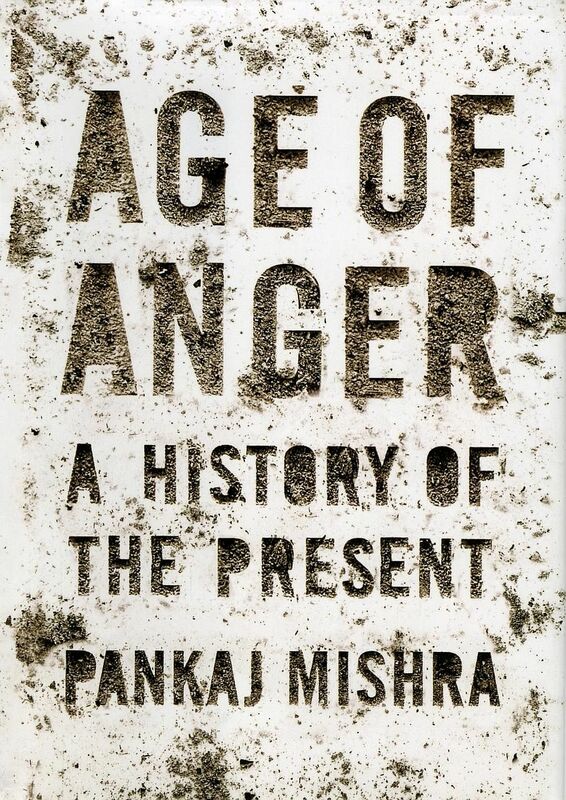 Pankaj Mishra has done an impressive swoop of global intellectual history, connecting thinkers such as Japan's Natsume Soseki to China's Lu Xun to Germany's Friedrich Wilhelm Nietzsche to India's Mohandas Karamchand Gandhi to France's Alexis de Tocqueville. His masterly, if turgid, approach to understanding why most people are so incensed today makes this book an authoritative entrance into the world of ideas. Mishra lays all the world's social ills at Mammon's doorstep. This is surprising because is not greater access to education equally to blame too for generating more and more people who can think, but are increasingly impeded from realising their potential? Among other things, Yale University awarded this son of Uttar Pradesh its Windham-Campbell Prize for non-fiction in 2014. In an anxious time when Singapore is ramping up security in public spaces, India-born author Pankaj Mishra offers food for thought on why it is needed more than ever in today's world of the fast and furious. Join senior writer Cheong Suk-Wai to discuss his book, Age Of Anger, on that at The Big Read Meet on April 26 at 6.30pm in the Multi-Purpose Room, Central Public Library, Basement 1, National Library Board (NLB) headquarters at 100 Victoria Street. Sign up at any NLB e-Kiosk or try your luck at the door. The Big Read Meet will likely be recorded on video to be shared on the National Reading Movement's Facebook page. In 2015, thinker's magazine Prospect named him among the world's 50 best thinkers. 1 Why do so many people today want to break away from life as it is? 2 What do racists, protectionists, extremists and lone wolves have in common? 3 When and why did the current wave of globalisation swell into a tsunami of hate? 4 Who tried to speak out against the dangers of pursuing self- interests? 5 How might humanity turn back the clock on rampant capitalism? In Age Of Anger, he takes the reader on a gut-wrenching tour of how morally backward humanity has become in the past three centuries, all in the name of getting rich and getting ahead. Largely through colonisation, he insists, the West successfully sold the rest of the world the idea that if one embraced capitalism and education, one would ultimately be able to live as freely as one pleased. That, went the narrative, was how Westerners wriggled out of the clutches of religion and monarchy. Alas, as Mishra shows by pitting French, status-conscious thinker Francois-Marie Arouet, better known by his nom de plume Voltaire, against Swiss moralist Jean-Jacques Rousseau, humanity went from the bucolic conviviality of agriculture to the cut-throat individualism of capitalism, fuelled further by the current wave of globalisation that began in the 19th century and has crested with the Internet and social media. For a century or two, he shows in copious examples, countries such as Japan "mimicked" the West's ways to economic development in the belief that it would guarantee them untold prosperity and peace. But as institutions of learning continue to churn out bright young minds, technological advancements have ensured that there are not enough jobs for them, with the plum jobs circulating among those favoured by self-centred demagogues and ivory-tower thinkers. This frustrates the disfavoured to the point of impotent fury and they burst the bubble of their dreams publicly by blowing themselves and others up by driving trucks into crowds, by stabbing strangers in the street. Now, none of the above is news, but Mishra is bracingly refreshing in his retelling of them through the lens of, ironically, thinkers, notably Russia's Fyodor Dostoyevsky. Dostoyevsky, for one, was disgusted at the representation of globalisation's achievement in Britain's Crystal Palace, a massive 19th-century building of cast iron and glass built in Hyde Park to house 14,000 trade booths from around the world. "Anarchy is a mindset, not a movement," Mishra stresses, noting how American Timothy McVeigh, who killed at least 168 people by bombing a building in Oklahoma City in 1995, got to talking with Pakistani-Palestinian terrorist Ramzi Ahmed Yousef in prison. Ramzi's uncle Khalid Sheikh Mohammed masterminded 9/11. As Mishra muses in the book's epilogue: "We may pretend to be entrepreneurs, polishing our personal brands, decorating our stalls in virtual as well as real marketplaces, but defeat, humiliation and resentment are more commonplace experiences than success and contentment in the strenuous endeavour of franchising the individual self." Age Of Anger is a hard book to get through, much like having to down a bile-bitter brew. But take the book in a few pages a day, as you would sip a herbal tonic, and you will likely feel better about your new learning - if not about the lot of humanity.